In a large punch bowl, stir together lemonade powder, vodka, and water until lemonade powder dissolves. Add ice and raspberries. Serve and enjoy! 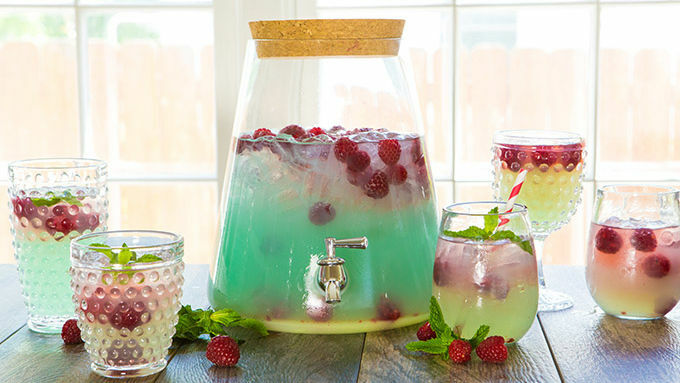 With a boozy summer punch looks this pretty, it’s time to start the party. When it comes to summertime, you cannot have enough boozy party drink ideas up your sleeve. After all, at any given moment on a 90-degree day, you could find your home full of people you love. And it’s always fun to make the people you love feel as pleased as punch. Which is bound to happen when you serve up this blue raspberry lemonade cocktail. Grab a bag o’ ice, a gorgeous glass dispenser (we found ours here), and prepare to have a chilly-rad cocktail ready in five minutes flat. Other than water, these four little ingredients are all you need. Lemonade mix, UV™Blue raspberry vodka, raspberries, and mint. Boom. Set out your party table. This cocktail comes together so fast, you’ve gotta be ready to celebrate. And now… watch as the magical blue punch comes together right before your eyes! With a little ice and lemonade powder, a splash of H2O, a happy wallop of blue vodka, and the quick stir of your fairy wand. Or spoon. Or whatever you use to make this magic happen. Quick! Call your people. You love them! Let us please them until their lips turn blue and their eyes sparkle with the light of a thousand Tiffany boxes. (See what we did there? Is this punch not the exact color of a Tiffany punch?) Pour, serve, and share. It’s Boozy Blue Raspberry Time. And it may just be the sweetest time of the whole summer.